What follows is an article which appears on the Yamaha corporate website. This article, written by Yamahas service manager, details the company’s position with respect to the purchase of used Japanese-made instruments. Following each of the six major points presented in the article we have responded with additional information which we believe is essential to making an informed decision on this issue. Customers frequently call Yamaha Piano Service to ask about purchasing a used Yamaha piano. Typically, they want to know how old the piano is, whether it is a good piano or not, how much the piano is worth and if they should purchase it or not. We do our best to answer their questions, from a technical standpoint. We first remind the customer that they are asking us about a used piano. We explain that there is always some degree of risk involved in purchasing any used product. Without a thorough inspection by a qualified technician, it is impossible to know whether the piano has been properly maintained, whether or not it is damaged, how worn out the piano is, or whether the piano is in need of major rebuilding. We recommend that they contact a competent piano technician and have the technician make a thorough inspection of the piano, before purchasing it. What should Potential Used Piano Buyers Should Be Aware Of? What’s The Main Issue With Used Yamaha Pianos Made for the Japanese Market? This is only half true because it fails to mention that not only pianos destined for North America but all Yamahas, including those destined for the Japanese market were produced properly seasoned for the American home. Computer-controlled drying kilns as well as other manufacturing procedures were used on all instruments produced in the Yamaha factory. This is simply not true. When the new equipment and manufacturing techniques were employed, it was a factory-wide changeover. This was the only way to achieve economies of scale, maintain efficiency and keep costs down in order to compete in the world market. At this time Yamaha began drying their pianos – all of their pianos – to the standard of European and U.S. manufacturers. After 1966 none of the dryness-related problems occurred in the states again. And none of these problems occurred in pianos that were sold to the Japanese domestic market after 1966 because the pianos were from the same factory, the same assembly line, and the same kiln-dried materials. Will one of these pianos develop severe problems after several years in the U.S.? Unless the piano is placed in a very humid environment (similar to Japan), the piano may develop problems that will be expensive to correct. We know this because of the numerous calls we receive from customers and piano technicians reporting dryness-related problems with these used pianos brought in from Japan. 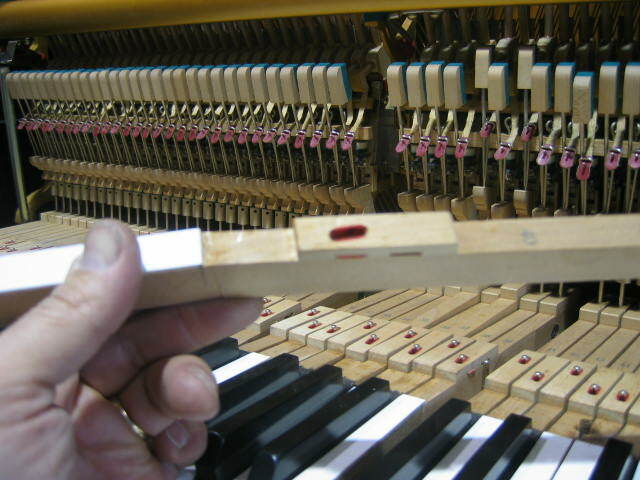 We do not experience these types of problems with pianos that are seasoned for the North American markets. This is obviously not true. Tokyo is at the same latitude as Philadelphia with almost the same average relative humidity. Japan spans latitudes from Concord, New Hampshire to Key West, Florida. Winters in parts of Japan are the same as in the northwestern U.S., with home heating systems drying the air to levels between 10% and 20%. Not all of Japan is a humid environment, but this article leads the reader to believe that. The truth is that there are numerous other suppliers of replacement parts for Yamaha parts and all other piano parts. In fact, many parts of both Yamaha pianos and many other piano makers are manufactured by specialized component parts makers. This happens in a wide variety of industries such as the automotive and electronics industries.